The next Business Breakfast will take place on Wednesday 31st May 8am – 9am at JTs Cafe at the Hesters Way Community Resource Centre and will feature speed networking! Speed networking is the business version of speed dating. However, in speed networking events, the participants readily share contact information with each other and decide themselves who they will follow up with. This type of event can provide exposure to a lot of people in a short amount of time. It is a way to let others know who you are and what you are looking for, whether new customers or clients, business or sales leads, or a new job or internship. Round Robin Format Moves Briskly The typical format for speed networking is called a round robin. The event leader will usually ring a bell, sound a buzzer, or blow a whistle to indicate the beginning and end of each round. Once the round begins, you introduce yourself and your purpose for being there, share your business card and perhaps, business brochure. A few questions and answers back and forth can quickly clarify if there is any potential for a follow up phone call or meeting. At the halfway point, the conversation switches to the second person, who introduces themselves and their reason for attending. After a second exchange of information, the event leader rings a bell and you move on to the next person. Practice a 60-second statement that includes your name, title or occupation, and what you are looking for, such as information, leads, a job or internship. Some people like speed networking because you get right to the point and there is no time for small talk. Make sure you have a supply of business cards ready. Sometimes event planners will suggest a number; bring at least 30. If you are unemployed at the time, get business cards with your contact information and occupation printed on them. Usually attire is either business or business casual. Check with the organizers if it is not stated. Viewpoint is a local magazine promoting activities events and great stories across the west of Cheltenham. The next 32 page full colour issue will be published in late June 2017. We’re looking for topical stories, photos, adverts and articles to for publication by Friday 9th June. Distribution of 6,000 issues continues via the schools, shops and community facilities and door to door in Hesters Way, Springbank, Fiddlers Green, St Marks, Rowanfield, Arle and St Peters. Articles – If you are a local group please send us a good story or project for us to publish; stories should be up to 350 words plus 2 jpeg photos. If you just want to tell us about it we can write the story for you!! If you would like to have copies displayed in your outlet please let us know. Back issues are available here We look forward to hearing from you! 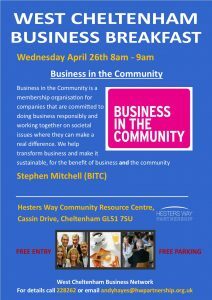 The next Business Breakfast will take place on Wednesday 26th April 8am – 9am at JTs Cafe at the Hesters Way Community Resource Centre. The newly installed Business in the Community representative Steve Mitchell will be coming along to showcase the plans for 2017-18. 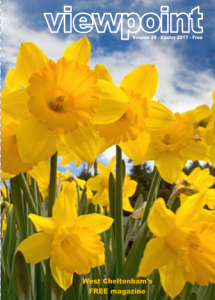 We at Hesters Way Partnership (HWP) are keeping the West Cheltenham residents up to date with all that’s best in the area via the Easter VIEWPOINT Magazine . We will happily visit your event, promote your new project or give you a little extra publicity if you are strengthening our community. The Viewpoint magazine is distributed in the local area via schools, shops, community centres and other outlets happy to stock them. We also have a door to door service provided by volunteers. We offer as broad a coverage of the local area as our resources allow. If you would like to help us with distribution, even if its only to your street, please let us know and we will supply copies. Thanks! Free copies of our Hesters Way Directory 2016 can be picked up at Hesters Way and Springbank Community Centres and an online version of the magazine and the new map can be downloaded from the link above. We are delighted to announce the start of a new bus route serving the West Cheltenham area. 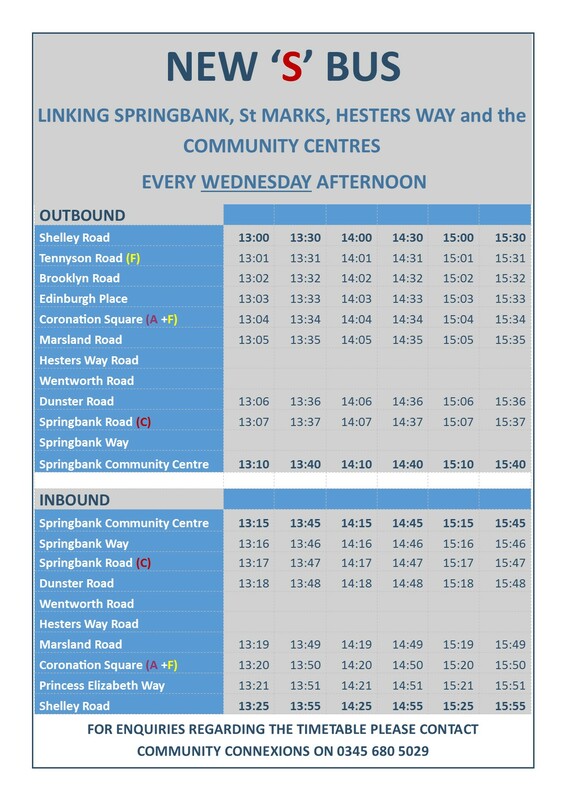 The S BUS ROUTE will commence on March 15th and link Hesters Way, St Marks and Springbank every Wednesday afternoon. This news comes as some consolation to the local community since the loss of the “C” route along Springbank Way. 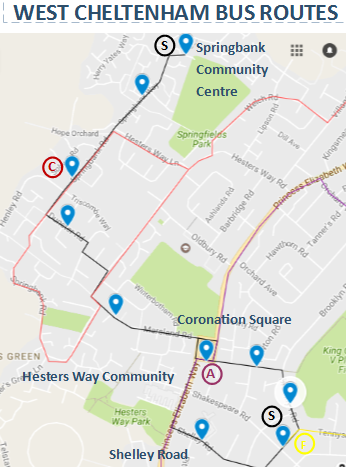 The new “S” bus (in black on the map) is being provided by Community Connexions thanks to a subsidy from the Gloucestershire County Council. If you hold a Concessionary Bus Pass you will be able to travel on the bus for FREE as usual. The bus will start at Shelley Road travel west to Tennyson Road and then Brooklyn Road, past the library to Coronation Square. It will then leave the Square on Marsland Road and head off to the Springbank Community Centre via Wentworth, Dunster and Springbank Roads. On its return from Springbank it will retrace its journey to Coronation Square then following Princess Elizabeth Way to Shelley Road. So if you want to visit the shops in Tennyson Road or on the Square or the community centres then the “S” bus could be just the ticket! Please take a look at the ‘S’ Bus timetable below. Strategic moves are being made across town which are of significance to West Cheltenham i.e. 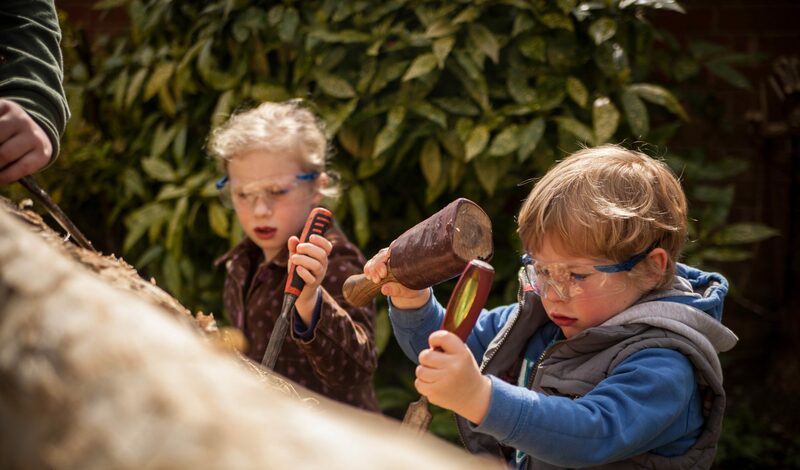 the next key consultation phase of the Cheltenham Plan (Part 1) This is our chance to prove the value of our Forum and come up with ideas to shape the Cheltenham Plan for the benefit of local people. As such we will be dedicating the next Forum meeting to submitting our views via the online consultation portal. As you will see there are a very large number of detailed documents; we’ll be helping you find your way through these on the night. HWP in partnership with The Cheltenham Trust have been awarded funds from Cheltenham Borough Council’s Positive Activities Fund to run Glow Sports session in West Cheltenham. The activities involve Glow Sports or glow in the dark UV sports, provides a social party sport experience where the focus is on having a good time, enjoying being with your friends and sharing the sensory experience. 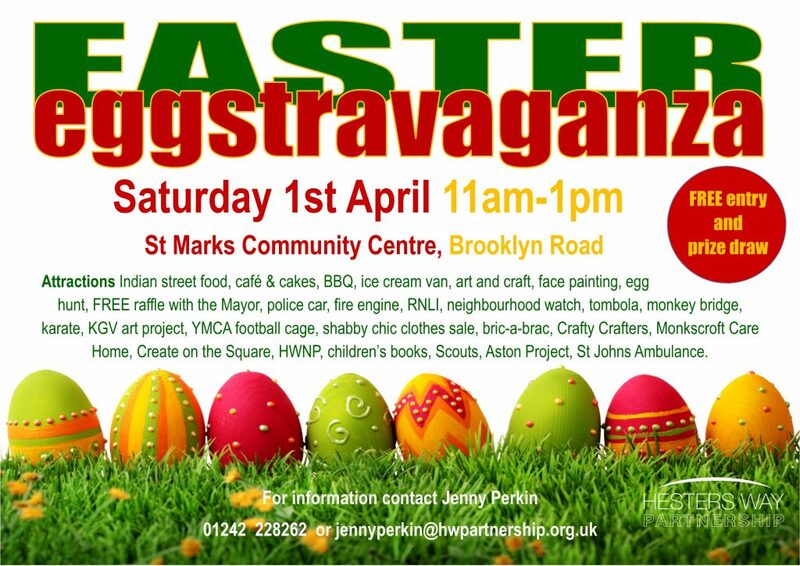 Hi folks, our Easter Eggstravaganza is on its way and we’ve booked up a whole host of local talent, activities and fun for your enjoyment on Saturday 1st April at the St Marks and Hesters Way Community Association on Brooklyn Road in St Marks. Indian street food, café & cakes, BBQ, ice cream van, art and craft, face painting, egg hunt, police car, fire engine, RNLI, neighbourhood watch, tombola, monkey bridge, karate, KGV art project, YMCA football cage, shabby chic clothes sale, bric-a-brac, Crafty Crafters, Monkscroft Care Home, Create on the Square, HWNP, children’s books, meditation, Scouts, Aston Project, St Johns Ambulance. Don’t forget entry is FREE and there are some fantastic prizes in the FREE raffle presented by the Mayor too! Regency Hampers have offered a £100 Easter hamper, Everyman Theatre four tickets to see The Gruffalo, Sudely Castle a family pass (two adults and three children), Talking Heads a beauty voucher worth £10, CW Pearce butchers a £10 voucher, Greggs a £10 voucher, a set of Usborne Books, a set of 20 Horrible Histories Books and chocolate Easter Eggs! 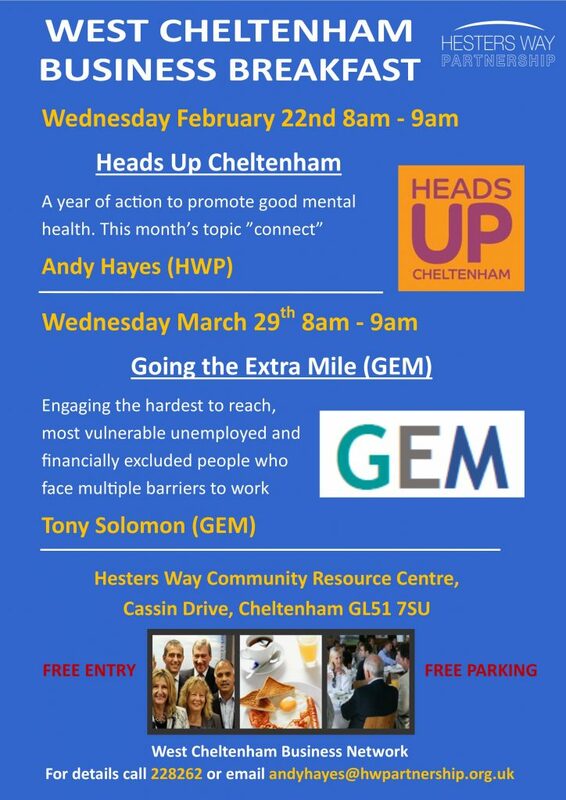 The next business breakfast on Wednesday 22nd February will feature the Heads Up project’s year raising the profile of mental health issues across the borough. To make things interesting we’ll be finding out about attitudes to mental health through a quiz on stigma. Its a very revealing exercise and I’m sure will be rewarding. If you want the answers you’ll have to drop in to the breakfast! The breakfast starts at 8am and is held at JTs Cafe in the Hesters Way Community Resource Centre. Jim offers a full English Brekky for a fiver and plenty of other healthy options. Come and check out his new menu. The next business breakfast on Wednesday 22nd February will feature the Heads Up project’s year raising the profile of mental health issues across the borough. To make things interesting we’ll be finding out about attitudes to mental health through a quiz on stigma. It’s a very revealing exercise and I’m sure will be rewarding. The breakfast starts at 8am and is held at JTs Café in the Hesters Way Community Resource Centre. Jim offers a full English brekky for a fiver and plenty of other healthy options at very competitive prices.